Pictures of Egyptian anti-government protesters killed during clashes with police and pro-government forces are displayed during a candlelight vigil at Cairo’s Tahrir Square on February 9, 2011. This is an AFP phot to which I have absolutely no rights. I will remove it if they ask me. Martyrdom was not sought nor celebrated by protesters engaged in the 25 January uprising. But martyrs there were–peaceful protesters fired on by police and by hired thugs. 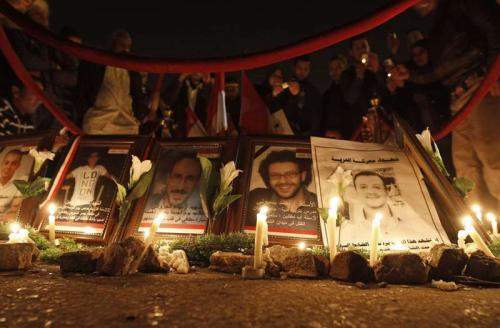 These martyrs became crucial symbols of the revolution, and the notion that the democratic and reformist impulse of the revolution must not be lost because it would render their deaths meaningless is still frequently invoked. Now, official figures have been released by the Egyptian health Ministry. They include data from private, police, military and university hospitals. 840 people died during the uprising, and 6467 were injured, according to Health Ministry spokesman Hesham Sheeha. Earlier figures in the 300 range were based on a more limited data set. These figures, Sheeha told Al-Masry Al-Youm, were based on data at sites where death certificates were issued. This figures are smaller that estimated by some rights groups, who suggested that as many as 1500 might have been killed. Web sites, makeshift candle-lighting sites, wall murals, graffiti and other media continue to remind Egyptians of the cost of the uprisings.